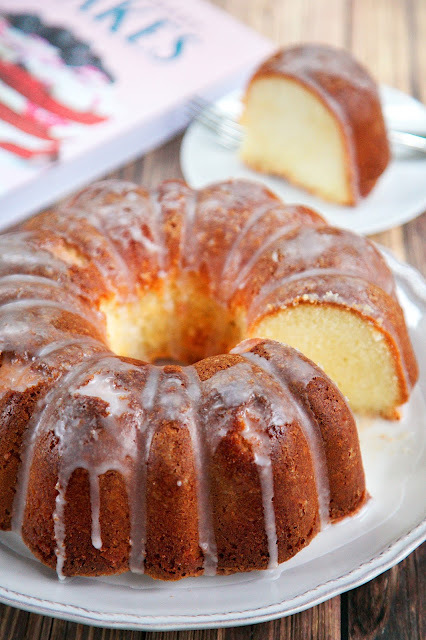 Mama's 7UP Pound Cake recipe - vintage recipe passed down for generations. Cooks low and slow for an amazing cake! One of the easiest and best pounds cakes I've ever made! I made this pound cake last weekend for our tailgate party. My team had an early game and all our football friends gathered at my parents house after the game for a cookout. Chicken Legs and I were in charge of the food. I made this 7UP Pound Cake because everyone loves a good pound cake. It was a huge hit! It took all my will power to leave the cake with my Mom, but I knew we would devour it if I brought the leftovers home. This recipe is from my friend's, Jocelyn, new cookbook. Grandbaby Cakes is a fabulous cookbook filled with 50 vintage cake recipes. Some are from her blog, Grandbaby-Cakes.com, and there are also many new recipes in the book. The one thing I love about her book is that it is filled with old family snapshots and heartwarming memories of her family's generations-old love of baking. I fell like I know her and her family after reading through the cookbook! Much like Jocelyn, I have lots of memories of cooking growing up. We didn't eat out much when I was growing up. We always cooked at home. I didn't know they made bags of cookie mix until I went to college and went grocery shopping by myself. My Mom and I always made cookies from scratch! 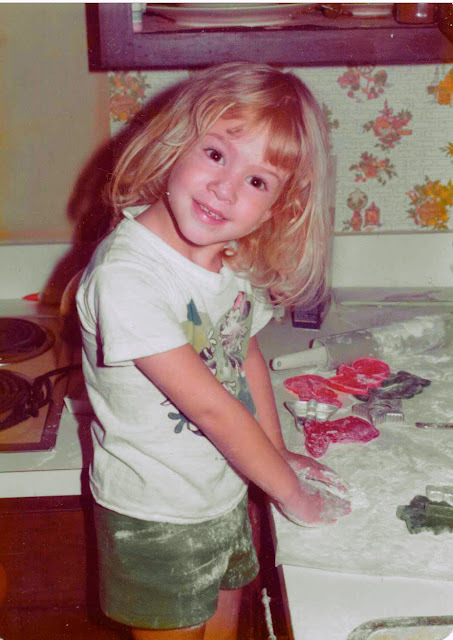 Here I am in our kitchen in Nashville when I was 3 years old. I'm making Christmas cookies in August. I actually have all those cookie cutters in my pantry. I love pulling them out during the holidays. They remind me of my childhood and making cookies with my Mom. Back to the cake. It is wonderful. One of the best I've ever made. This cake cooks at a low temperature - 315 degrees. There are also no leavening agents in the cake batter. Make sure to follow the cooking process listed. The longer creaming time adds more air to the batter, giving it the lift it needs. Preheat oven to 315 degrees. Prepare a 10-cup Bundt pan with the nonstick method of your choice. In the bowl of a stand mixer fitted with the whisk attachment, beat the butter for 2 minutes on high speed. Slowly add the sugar and salt. Cream together for an additional 7 minutes, until very pale yellow and fluffy. Add the eggs 1 at a time, combining well after each addition and scraping down the sides and bottom of the bowl as needed. Turn the mixer down to the lowest speed and slowly add the flour in 2 batches. Be careful not to overhead. Pour in the 7UP and lemon extract. Scrape down the sides and bottom of the bowl and mix the batter just until combined. Be careful not to over mix. Pour the batter into the prepared pan and bake for 75 to 85 minutes, or until a toothpick inserted into the center of the cake comes out clean. Let the cake cool in the pan on a wire rack for 10 minutes, then inver onto a serving plate. Let cool to room temperature. Lightly cover the cake with foil or plastic wrap so it doesn't dry out. For the glaze: in a small bowl, whisk together all ingredients until the mixture is pourable. When the cake is completely cook, spoon the glaze over the cake and allow it to harden. Serve at room temperature. My fave family recipe is a macaroni chicken soup. Our family's favorite recipe is peach cobbler. We have a very old recipe for a Sour Cream Coconut Pound Cake, which is divine! This one looks great too! Can't wait to try this! Looks yummy. I don't think my family has one particular favorite. We have several but if I have to pick one, I will say German Chocolate Cake. There's too many favorites in our family to mention. Mom made sure all 3 of us boys knew how to cook and a couple of us still enjoy doing it. My favorite family recipe is my grandmother's fresh apple cake. Yum! Our favorite recipe is a lasagna recipe passed around and down. This looks like the perfect classic bundt cake recipe! I would love to try out all her others! We have a chicken paprikash recipe that my sister has perfected over the years. My favorite family recipe is nut roll made at Christmas and Easter time. This looks yummy and i love the cooking memory. have to try it! My fav. family recipe is my Mom's meatloaf & mac n cheese. I have tried so many times to replicate them but they just don't taste the same as hers. My favorite family recipe would be "mom's banana bread". I know how to make it by heart, and it's a one bowl, never fail recipe! I have always wanted to make a pound cake. I just never attempted it. Yours looks so yummy! Seriously my friend this looks absolutely sensational. I want a slice of this cake RIGHT NOW!!!! Thank you so so much for participating. I'm so grateful!!!! Our family recipe is Pretzel salad..
My favorite recipe is my Mema's lemon lime pound cake. Delicious! My favorite family recipe is my great grandmother's fried chicken. Reminds me of my grandma. Can't wait to try this! My favorite family recipe is peanut butter sheet cake. 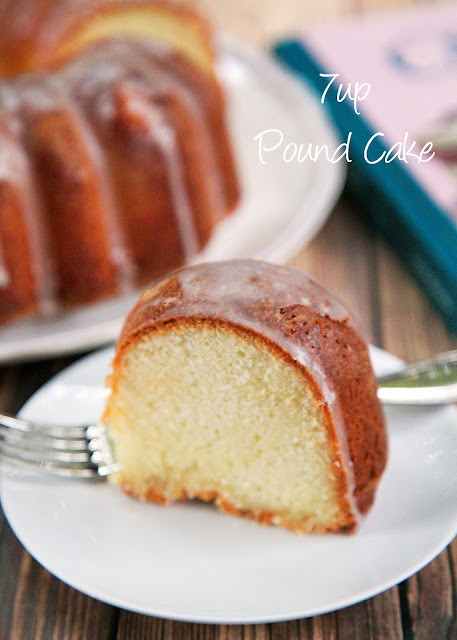 This pound cake sounds so good. My favorite recipe is my grandmother's Red Velvet Cake. My favorite family recipe are my grandma's Christmas cookies. She has many recipes passed down through generations of women and they are all equally wonderful! My family's favorite family recipe is one from my mother-in-law. It's a stir-fry sort of recipe that his family referred to as "Chinese Goulash" when he was little. I just made it last night, in fact! Thanks for sharing this cake recipe with us - looks great! Myf avorite family recipe is my grandma's waffles with chocolate gravy. Awesomely delicious, they never fail to bring back memories. Red velvet cake. Hands down. I have several favorite recipes I made with my mother...but my MOST favorite is making Millionaire Fudge with her! An oldie, but goodie--my mom's chocolate chip cookies! A winner every time! My favorite family recipe is my grandmother's pineapple sheet pie with vanilla glaze. My grandmother's dish Stephen Gurley gravy named after y uncle's best friend! Favorite family recipe is my mom's meatloaf! One of the things I remember most about my Grandmother from childhood was her wonderful pound cakes. She always baked something special when the grandchildren came over and this reminds me of one of her recipes. Think I will make this for my own children tonight. My favorite family recipe is my mother in law's sugar cookies. My Kids and I make them every Christmas. They are the best! My favorite family recipe is chocolate cake with buttercream frosting. My Mom and I used to make the Wacky. Recipe called for vinegar. German Chocolate Cake!! My grandmother always made it for me and with me. This looks tasty! My family favourite is my nana's bread pudding! I like my mom's lasagna recipe. My father's peanut butter fudge is the best! pizzells --- my grandma's recipe and her iron. My sister-in-law has taken over the duties every Christmas since my grandma passed. Pumpkin pleaser cake is our favorite fall dish. It has to be my mom's Christmas sugar cookies which we all call the pink cookies. It just isn't Christmas without those cookies! They are the best. Our family recipe is Chocolate Steamed Pudding, a recipe brought over from Ireland many generations ago. My grandma's meatballs! I used to help her make them. Now that she's not here anymore I am still using her recipe but they just don't taste the same! Our family favorite is chocolate chip cookies. My mom's special recipe (off the chocolate chip bag) and I add a little cinnamon to them to make then a little different from my mom's. I love my family's recipe for Chocolate Sheet Cake...oh I can taste it now! Favorite family recipe would be my mother's rolled molasses cookies! I love my family's chocolate cake recipe with peanut butter frosting. My mom's macaroni and cheese, I never seen another recipe even close to hers. Part of the secret is boiling the pasta with dices onion in the water! Delish! My family likes monkey bread on the weekends. Very nostalgic. Our family favorite recipe is Buttermilk Pie. My grandmother's date nut roll for the holidays is our favorite. My grandpa's honey oatmeal bread! Our favorite family recipe is mac and cheese that involves Velveeta, Cracker Barrel cheese and tomato soup. Yum, yum! I love my mom's taco salad recipe. Thanks for the chance to enter. My grandma always made soft ginger cookies that I loved. I make them at Christmas now! My favorite family recipe is our decades old Pumpkin Bread. I make it every fall in big batches! Our family makes a decadent candy from the juice of palm trees that are collected in clay pots during the summer from the palm fruits. My grandmother would cook the palm fruit juice with a blend of sweet spices of cardamon and ginger and others over a large wooden fueled open fire until it solidifies and create delectable melt-in-your-mouth candy pieces. We still continue to do that unto this day. My family loves baked ziti! That sounds so good right about now! Our family favorite is Key Lime Pie! My favorite family recipe is for Old Fashioned Fudge! One of my favorite recipes comes from a hospital co-worker via my Mom, peanut butter balls. A Christmas favorite. My favorite family recipe is my grandmothers "summer casserole".. its easy, delicious, and always a crowd pleaser-- and its also great any time, summer or winter! Pound cake has been a HUGE pregnancy craving, I'll have to make this and try not to eat it all in one sitting!! We are in the middle of a kitchen reno, but as soon as I have a kitchen again, this is a definiate try. My husband loves pound cake! My favorite family recipe is caramel pecan rolls. I love my mom's chocolate chip cookies! they are amazing! I love your mom's recipe for cheesecake. I have made it many times. My family's favorite recipe is peanut butter cookies! Our favorite family recipe is coconut pie! I love our homemade schnitzel! My grandmother's chocolate cake with cream cheese icing is a family favorite! Our family doesn't really have a favorite. Can't wait to make this recipe! Would love to win this giveaway. Pick me. Pick me!!! I love my mom's squash casserole. I can duplicate it pretty good, but her is always the best. My favorite family recipe is carrot souffle. Our favorite pound cake is a Cream Cheese Pound Cake. It's an easy, goood recipe. My mom's carrot cake-- I don't know what kind of crack she puts in it, but I crave that cake! My mom's recipe for Swedish meatballs!! Yum - the best!! Our favorite recipe is for a lovely German Apple Cake that we make every fall.. It is handwritten on the back of an old paper place mat by a dear pastry chef named Bea.. I treasure that bit of paper. My favorite recipe is my grandma's chicken and dumplings!